Tom Toles’ editorial cartoon in todays Washington Post says it all. I’ve been warning folks about this for years – and alas, fake medicine and quackery has finally oiled its way into the healthcare reform bills. We are in the midst of a growing primary care shortage, and on the brink of vastly expanding health insurance coverage without increasing the supply of physicians and nurses. How will our country solve the supply/demand mismatch? 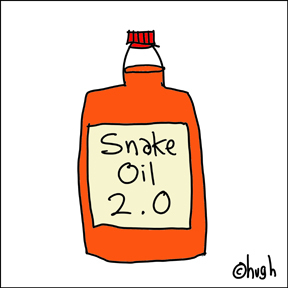 Potentially by allowing people without appropriate training in science and medicine to become your “medical home.” That’s right – your next doctor or nurse may be someone with an online degree in snake oil salesmanship. As the great campaign to reform the American healthcare system heats up and enters an important new phase – the phase in which key legislative leaders take the five bills that have been passed, here and there, by sundry Congressional committees, and, behind closed doors, attempt to cobble together a compromise bill which they believe they can threaten and/or bribe a majority of Congresspersons into supporting – many Americans find themselves confused about what it all means. What, after all, are we attempting to accomplish here? How much will it cost, and who will pay for it? Why does the whole process seem so darned difficult and confusing? Surgeon: You need an appendectomy. You: What are my options? Surgeon: Either I take out your appendix or you die. Now that’s a conversation people can understand. But what if, instead of whisking you up to the operating room, the surgeon kept talking and invited a few other people into the discussion? Surgeon: Do you think I should take it out by an open operation or laparoscopically? Laparoscopy equipment salesman: You know, cutting you open the old-fashioned way and leaving a big scar or having a tiny incision. Laparoscopy is much better than the open procedure. Guy who sells scar-removal cream: Wait a minute. Better for whom? Laparoscopy takes fourteen minutes longer. Hospital administrator: But hospital stay is reduced by 0.7 days on average, patients have less pain, and you can return to work sooner. Surgeon: Laparoscopy costs more than an open operation while you’re hospitalized but less once you’re home. What’s your co-pay? You: Doc, my belly’s hurting a lot more now. Guy who owns shares in a drug company: What if we just treat him with antibiotics? Surgeon: Don’t be silly. His appendix could burst. Funeral director: What about doing nothing? Very smart people are zoning out of the health care reform debate because they think it’s just too complicated. The latest poll out today from the Kaiser Family Foundation, a nonpartisan health-care-policy research organization unaffiliated with Kaiser Permanente, says only 27 percent of the public has been following the health reform debate closely. Despite this, more than half (56 percent) of Americans think health reform is more important than ever. Coverage expansion and subsidies. This is where most of the estimated trillion dollar price tag over ten years would go – to expanding Medicaid for uninsured and lower income people and to help people who can’t afford it pay on a sliding scale for insurance through new health insurance exchanges. Insurance market reforms. This is about fair play in the insurance industry. Advocates want to eliminate practices such as refusing to cover people with pre-existing conditions and jacking up premiums if they’re sick. The most controversial proposal is the establishment of a “public option” – a government insurance plan that would compete against private ones. Delivery and payment reforms. This is about delivering more effective care at a lower cost. About 20 percent of the 2.5 trillion dollar annual health care price tag does not contribute to better health. Half-truths feed on fear. People are afraid of losing or compromising what coverage they already have. They’re afraid of higher taxes and lower quality of care. Who has the time or patience to read the 1,000-page bill proposed by the House of Representatives? So we rely on summaries and are susceptible to all sorts of misrepresentation. And nobody wants a plan with major faults rammed down their throat in the name of political expediency. No, you’re not stupid if you’re confused about health care reform. But you may be psyched out. You probably know a lot more than you think – but you may need to do some homework in order to participate in this extraordinarily important national debate. The national debate needs you. For this week’s CBS Doc Dot Com, I moderate a debate about the public option between Wendell Potter, former head of public relations for Cigna and Rob Schlossberg, Executive Sales Director for BenefitMall. Mr. Schlossberg opposes it and Mr. Potter favors it.